May 30, or 530. 5 3 can be read "gomi" in Japanese which means garbage. So what does May 30 mean in our village? Garbage 0 day. This morning, I participated with most of the village in picking up trash and junk around the village. Along one of the roads, there was an area that was clearly being used as an illegal garbage dump by many people. There were mufflers, car batteries, toilets, beds, bicycles and even a car dumped there. We spent the morning hoisting this junk out of the mud and carrying it in trucks to a location where the local government would come and collect it for us. There were many children helping out as well. Hopefully this annual garage day will help educate them not to dump trash by the road. I got a chance to meet more of my neighbors so it was nice. I still have a hard time remembering everyone's name but sharing this massive chore with the whole village was quite a bonding experience. These village chores are called gyoji and there are many others including trimming hedges and trees, cleaning common spaces and fixing roads. The Japanese countryside is one big dumping ground for rusty cars and old washing machines. You'll also find stuff dumped into streams and gullys on any deserted forestry road. And the more into the countryside you get, the more land people have, so they seem to think, "Hey, why pay to have it hauled away when I can just put it on a corner of my property and let it rust?" Finally, the lack of any effective zoning regulation means that houses will be right next to small manufacturers, construction companies, and the like, who will have even more junk on their property. Older people come from a period when you just burned everything, so that's what they do, and amazingly, there seems to be no law against it. Unfortunately, most stuff is plastic nowadays. The smell of dioxin is common in the air. And asbestos is used in construction to this very day in Japan, but houses are torn down after 25 years and rebuilt. Home reform shows are popular on TV now, and you can clearly see the preferred technique for tearing down old houses: put a dust mask on and just destroy everything with sledgehammers, creating billowing clouds of dust, containing who knows what. Living in a country that has such high costs for disposing of garbage makes abandoned trash inevitable. On the other hand, the high cost of throwing stuff away, combined with the requirement of dividing up garbage into a dozen categories in some localities (plastic, garbage, paper, non-burnable, foam trays, milk cartons, batteries, plasic bottles, glass bottles and cans, clothing, etc.) has made me think even when I'm buying something new about what it'll cost me to get rid of it. I would never even think of buying a new mattress unless the old one was completely in tatters: you have to pay them to pick it up and rip it apart, separating the springs, synthetic, and natural material. Most of the cost of a new mattress is paying to get rid of the old one. Sounds like what Japan needs is a good dose of Freecycling. If you haven't heard of it, it is a listserve on Yahoo Groups where poeple post what they have to get rid of, if it is rusty cars that someone might like to fix up, an old mattress that someone can use because they can't afford a new one, used furniture, excess construction equipment, old computers, children's clothes, an old half can of paint that an artist can use, whatever. All for free. Then someone wants it, and arranges to pick it up. Freecycling is exploding in the States, with at least three new groups in my area in the last month. I see that Japan only has two groups (Tokyo, Osaka) registered at www.freecycle.org, and I thought perhaps you, joi, would enjoy promoting this concept. It too helpes promote community and can help reduce landfill (legal or not) and incineration loads. Please feel free to email me with comments. 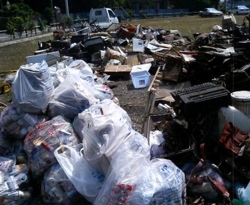 Freecycling will not work in Japan. People do not like used things here and there are tons available already. Basically, Japanese people throw away tons of perfectly good stuff because no one wants it. The late 80s and early 90s were the best gomi picking days. You could literally find stuff like new stereos still in the box, being thrown out. People use Yahoo Auction here to get rid of their good stuff. The "buyer" just pays for the shipping. The solution to this problem is to have people pay for disposal when they purchase the product. Big ticket items like cars, Washing machines, etc. are all over the country because people are too cheap to pay for them to be properly disposed of. It is really ironic since Japanese people are pretty civic minded. Would it cost a lot to pay in advance to have your garbage disposed of? Probably. But currently society pays in many ways that when added up, cost a lot more. But with all of the other financial problems this country has, no one is probably in the mood for another law which raises the cost of living in the short run. The time to introduce laws which improve the environment is when the economy is doing well. We have not seen those days for many years. I am actually of the mindset that we humans, not being the smartest and most responsible animals on the planet, should hurry up and be killed off like the dinosaurs. Yet unlike the dinosaurs we won't need any stinkin' meteor to wipe us out, we will do that for ourselves. With everything we have learned about past cultures, diseases, resources, over population and throwing out junk...it seems inevitable that the next order to take over the planet can learn from our mistakes. I try to litter at least twice a day. Swap meets and flea markets (or as the Japanese spell it, "free markets") are getting really common, and are in effect freecycling, since the prices are so low. But the merchandise is mostly clothing. Anything big or over 1,000 yen would work at these events. Swap meets and flea markets (or as the Japanese spell it, "free markets") are getting really common, and are in effect freecycling, since the prices are so low. But the merchandise is mostly clothing. Anything big or over 1,000 yen wouldn't work at these events. "There were mufflers, car batteries, toilets, beds, bicycles and even a car dumped there." I remember when I was a kid and my family used to visit her and my uncle, before they moved to the trailer park they were in for the last six or so years of her life, and in which my uncle still lives. Before that, they lived in a series of rented houses here in El Cajon (that was before the prices went so high, when you could still rent a house for a reasonable sum). Unlike most Californians, they brought with them the stereotypical Deep South attitude of yards. It's incredible how much the U.S. and other societies have become throw-away societies. I learned to recycle and reuse everything while growing up. I remember how often we would cart our used items and old clothing to our impoverished relatives in Mexico. They were so appreciative of anything we would give them. It's ironic how one learns to appreciate things when one has nothing. I am often shocked when I see perfectly good items thrown out by the dustbin. (Especially when it's the end of the university semester and the students move out.) I used to collect vintage items, and I would often find some of the best pieces by the dustbin, at flea markets, or even by the side of the road. So, I encourage people to donate used items to charities, recycle centers, or even try to sell the item if it's in good shape. P.S. Great idea! This blog thing. I long for a day when our cities and towns and villages would act like villages. I only know four neighbors in my complex, and there are more than 80 people who live here. Kudos to you for participating in the clean-up. It's funny how that the common joe blog only thinks of what he/she wants but when it comes the time to dispose of it, it then becomes a problem. Having to get rid of things, is one of the nastiest chore we face in this day and age, and as time passes the garbage heap grows and grows. Maybe it's not the the consumers problem, but the producers and manufacturers. I know, most people will pay that little bit extra, knowing that the packaging/product that they are about to buy will be environmentally friendly, and will either be recyclabe or bio-degradable. Another problem is peoples laziness. Sometimes it's much easier to just drop the item on the ground than trying to find the nearest rubbish bin. I know where i live, theres always a rubbish bin every 30 odd so meters down the road, and gets cleaned a few times everyday. Theres is not a single piece of litter in the city in sight. I guess it's all about conveniency to the public, and not having to put in the unnecessary effort required to dispose of an un-wanted object. Listed below are links to blogs that reference this entry: Garbage day in the village. Joi Ito - "Garbage day in the village" by Joi Ito is licensed under a Creative Commons Attribution 4.0 International License.